The official Mythbuntu website offers various options for downloading via a dedicated download page. It's possible to 'add-on' Mythbuntu to an existing Ubuntu installation (details on the Mythbuntu site -- basically it involves downloading the MythTV and related packages from the Ubuntu repositories), though for this project I was building a new machine from scratch so selected the 'New Mythbuntu install' type. The disk image comes in a 32-bit and 64-bit version which should be selected depending on your processor architecture. The hardware I chose was 64-bit capable (as are a lot of CPUs now) so I selected 64-bit, though the 32-bit will also work on a 64-bit processor (but not vice versa) although you wouldn't take full advantage of the 64-bit capability in that case. Having selected which version to download, you can then choose to download from the Mythbuntu site itself (or a mirror), or from a 'torrent' (a peer-to-peer download method which is often preferred as this distributes the load a lot more since everyone isn't hitting the main server at once!). I used the 'Transmission' BitTorrent software (I'm already using Ubuntu on other machines) though similar software is available for most OSs. 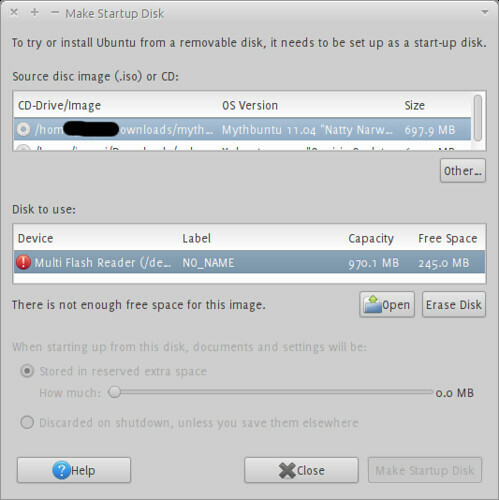 Mythbuntu can be run from a live CD or USB stick by downloading the 'ISO' disk image and booting from the live disk before committing to a full installation. (In fact you don't even need a hard drive to run the live disk, as it is all run in RAM -- I did my first boot before having the hard disk in place! Obviously you need some persistent storage to actually install it though...) To create a bootable USB stick, first ensure that your intended motherboard supports it, and then create the live disk using the Startup Disk Creator or similar utility. Depending on the specific issue it may be applicable to any *buntu, not just Mythbuntu as such. Except where noted otherwise Open Source HTPC by seventyeightist is licensed under a Creative Commons Attribution-ShareAlike 3.0 Unported License.